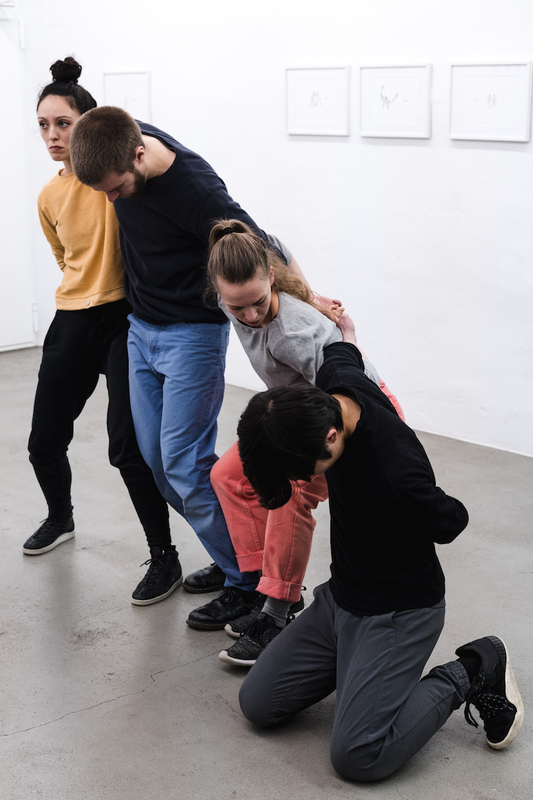 Karma Ltd. Extended, a curatorial collaboration between Pauline Doutreluingne, Petra Poelzl and Jana J. Haeckel, is currently presenting an audacious series of durational, process-oriented performance works at ACUD Galerie. 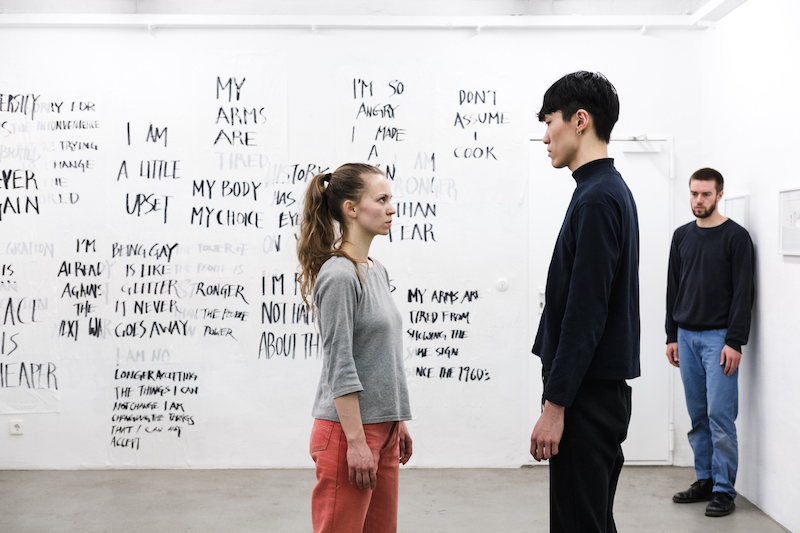 ‘Transcultural Transience’, the second chapter in their year-long curatorial programme, features newly commissioned pieces by multi-media artists Isaac Chong Wai and Rachel Monosov. 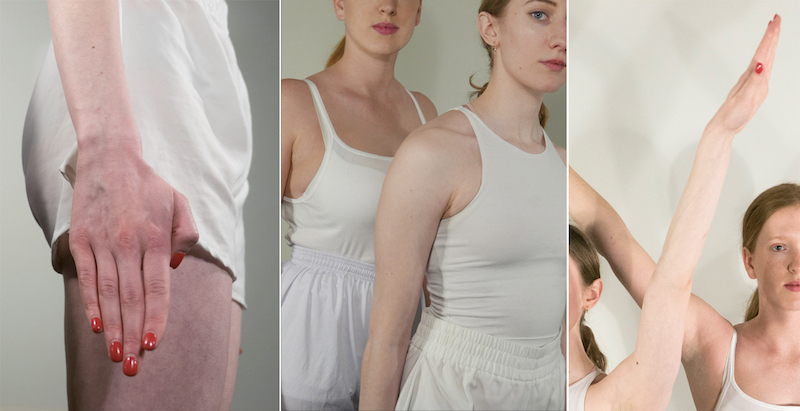 Centring their research around the embodiment of collective memory, both artists have taken the body as their starting point. Chong Wai’s ‘Rehearsal of the Futures: Is the world your friend?’ was inspired by video clips from news reports of political protests and activist groups. From this footage, Chong Wai extracted the movement and distorted it: four dancers move in extreme slow motion, working through an assemblage of fifteen scenarios that are marked, in time, by a row of sketches hung on the gallery wall. Moments of violence are ruptured by moments of solidarity and gentleness, creating a repertoire of tasks that, in their abstraction, become the object of analysis. With his stark minimalist approach, Chong Wai encourages the viewer to question the universalist nature of the actions portrayed rather than the specific instance in which they occurred. In parallel, Monosov presents ‘Olympia’, her eponymous piece drawing from Leni Riefenstahl’s artistic documentation of the 1936 Olympics. Now primarily known as Nazi propaganda, Monosov explores the re-enactment of various gestures, most notably the Olympic salute from the film, and appropriates repetitive routines from fitness videos from the 1930s. Interested in the underlying humanity of aestheticised bodies, Monosov magnifies the moment of preparation before the athlete takes the risk to perform their physical act of perfection. She seeks to unravel the heroism that is accredited by the outside world, revealing the fragility and vulnerability of the person behind their greater goal. Her female performers are hereby brought to a point of physical exertion in which the tools of “non-empathy” in the viewer are utilised to ultimately elicit compassion. Archival footage has been used by both artists as a means to dive into political events and reconstruct our collective memory. The movement material, performed outside of its original context, evokes new readings and adds another layer of interpretation to the already recognised historical and political narratives. In line with Karma Ltd. Extended’s curatorial aim to intervene in current rhetorics of powerlessness and demotivation, these works create a new space for political discourse and represent alternative modes of engaging with pertinent topics. The performance works by Chong Wai and Monosov both offer critical and contemplative views on collectivity and function as an invitation to reflect on our current political climate. The gaze of the onlooker thus plays a central role: Are we, as viewers of the works, engaging in a political act? Can watching in itself be considered political? With questions such as these bubbling up and cooking under the surface, ‘Transcultural Transience’ succeeds in breaking default states of detachment. With several chapters ahead, Karma Ltd. Extended promises many more provocations to come.